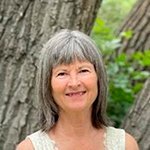 Kathy Ziola, MA and CNVC Certified Trainer, lives in Grand Junction, Colorado where she offers Nonviolent Communication (NVC) training and coaching in a variety of settings. She is especially passionate about sharing NVC as an inquiry practice that can bring people to a place of deep awareness of presence from which all compassionate action may be sourced and extended to the world. Kathy writes poetry and is currently publishing CD’s and a book. You may connect with Kathy for all training, services and poetry resources at www.communicationworks.us or by phone at 970.216.8597.